Hannah Miley will attempt to record the times she needs to qualify for a further two Commonwealth Games events at next week's British Championships. 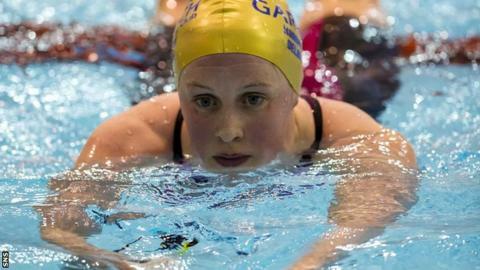 Miley has won five titles at the Scottish National Open Swimming Championships at Tollcross in Glasgow. But she did not post the 400m freestyle and 200m breaststroke marks needed to race in those events at the Games. "I will have a lot more competition, so that might push me a bit more," Miley said of next week's event at Tollcross. "We'll see how that goes as I need to get back into my training now as well." Miley won the 800m freestyle and the individual medley at both 200m and 400m in Games qualification times earlier in the meet before taking the 400m freestyle and 200m breaststroke titles. "Sadly, I've just missed out on the freestyle and breaststroke today, but I've got the British Championships next week," the 24-year-old told BBC Scotland. "For me, it was just about making sure I was rested enough to get the times but not lose any training and it's gone really well at the moment. "Once the 100 IM was out the way and I got the time, that took the pressure off my shoulders." The European 400m individual medley champion, who won gold at the event at the 2010 Commonwealth Games in Delhi, is hoping for more than just one medal in front of her home supporters. Asked in how many events she would like to compete in Glasgow, Miley replied: "Hopefully four. Four or five would be great and that means I get at least one race a day instead of backing up and doing two or three. "For me, it's kind of tame as I'm not doing as many races as I normally do. "To get at least four swims at the Games would be great and, if any relays come off the back of that, we'll have to wait and see. "The 100m IM is on day one, which is perfect. After that, I can enjoy the rest of the meet."